...understand the definition and impact of lateral leadership. ...lead an agile team of domain experts as a generalist. ...solve conflicts when you're not the boss. My book on Lateral Leadership for Product Managers was published by Sense and Respond Press - The publisher for short practical business books. The book helps you master the challenges of being a lateral leader - In small-scale startups and large corporations alike. It will guide you through chapters on strategic alignment with your organization, process alignment within your team, and individual alignment with other team members. By also recognizing empathy and escalation as helpful tools, you’ll be able to maintain and strengthen your leadership role. Product Managers tend to have all the responsibility and none of the authority, yet we don’t talk enough about how to lead teams without that explicit authority and leadership. 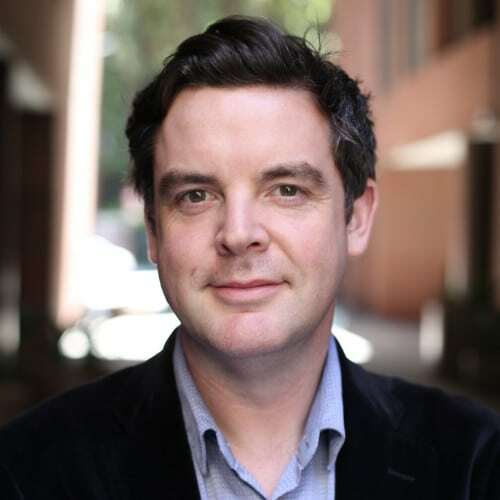 In this book Tim gives us a roadmap for how to use empathy and alignment to better lead the people that make up our teams toward common goals, and build better products because of it. ​Communication and influencing skills are very important to product managers. We don’t line manage the people that need to help us get work done, and we often can’t do what they do ourselves. This book clearly explains the role of the agile product manager, and provides activities to help define and communicate intent across cross functional teams. Based on various practical examples, Tim describes very well the challenges & complication of modern Product Management, which is supposed to lead without formal authority. In my opinion, "Lateral Leadership" is an essential Product Management book that should not be missing in any proper product-related bookshelf. Fantastic little book that provides tons of little tips'n tricks, guidance and tools to handle the growing demands of modern workplaces - especially in agile settings. I really enjoyed reading this book. It was quick and easy to read, no long sentences or extensive descriptions. It's grouped into 3 main sections, with an introduction and conclusion. 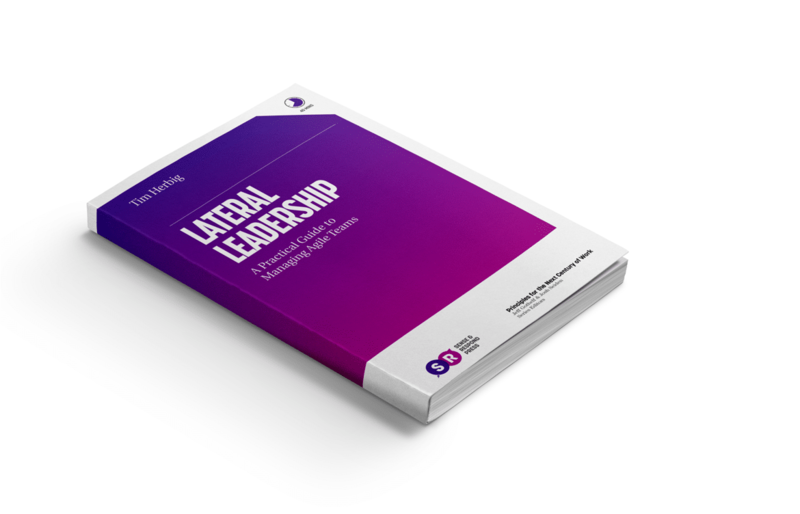 Starting with a definition of Lateral Leadership (leading without authority, especially in agile work environments), the author describes the three key elements of successful leadership extensively: Strategic Alignment, Empathy and Escalation. For each, he provides measures and tools on how to achieve them. Overall, a great read - will get a place on my desk, as the situations described pop up in my work as product manager almost daily. Now I know where to look for advice & help! What is a lateral leader? As a lateral leader, you're responsible for the results produced by a team without formal authority over the team members. Let that inform your way of influencing (and ultimately leading) them. Which means that you can't rely on hierarchical management tactics like command & control or disciplinary measures but have to work at the intersection of alignment and empathy. Agile requires a radically different approach to leadership, one that puts business, design, and engineering at equal levels-where they must work as peers. This situation creates a challenge for team leaders. Agile leadership requires teams to align with a committed vision and support it in the best possible way. And even though agile leaders lack the expert knowledge of their new peers, they have to succeed with their mission without the traditional safety net of hierarchical power. This sort of change is the result of agile methodologies spreading beyond the product and technology context. As individuals and departments adopt the benefits and underlying principles of agile methods, this, in turn, gives rise to entirely agile organizations. Leading teams within these organizations without traditional hierarchical systems is called lateral leadership. It’s the most impactful way of leading agile teams and will become crucial to success in future business environments and ways of working. To understand why product managers are lateral leaders instead of hierarchical leaders, I want to emphasize how companies around product managers are usually structured. Even though (SCRUM) teams are intended to work as a unit by itself, the team members taking care of engineering and design are most often only ‘led’ by the product owner within the construct of a development team. Every team member has other people managers who are overseeing the respective departments across multiple development teams and sometimes even business units. There’s an excellent book by Daniel Pink called ‘To sell is Human.’ In it, Pink even refers to this skill as the ability to “move” people from one mindset to another. Successful product people need to spend time and effort on these ‘moving’ activities, bringing everyone together around a shared understanding of the customer or business problem. So that ultimately, everyone can be involved in helping solve it to further the business goals. Sounds familiar? Good, then you recognized the pattern of alignment. Closing the loop on the fundamental challenge the product owner faced, a likely reason for a development team not accepting a task is the lack of context. More precisely the meaning around why this task matters in the grander scheme of things and how its execution moves the needle. Agile frameworks often times focus way too much on the process and role side of collaboration. But ultimately, your product won't only succeed because of following a given process, but when you can channel the motivations of your peers into meaningful work. To support you on that quest, I created the Agile Peer Canvas. It combines the process and empathy component of agile collaboration for a holistic perspective of your peers. The canvas thereby supports you in building a team dynamic based on empathy and clarity. And ultimately, it's also detached from ever changing environmental factors like Scrum, LeSS etc. to let you focus on the permanent factors of a successful team. I consent to receive the regular newsletter on product management and occasional emails about promotions, new products, and partnerships. Mission - What’s the essence of this role captures in one sentence? Do's - Explicit tasks which are clearly assigned to and owned by this person. Don'ts - List the most important tasks which this person should explicitly not tackle (counter-examples). Hopes - What are the expectations of this person of what to get out her role? Fears - What is holding the person back? Drivers & Motivators - Which aspects of her work make her accel and push-through? Informal Role - Which team-internal role could leverage the drivers of this person beyond her job description? Schedule a workshop with a set of peers who form a cross-functional team on a regular basis. Whether it’s a task force to tackle a new legal regulation or a ‘classic’ Scrum team. 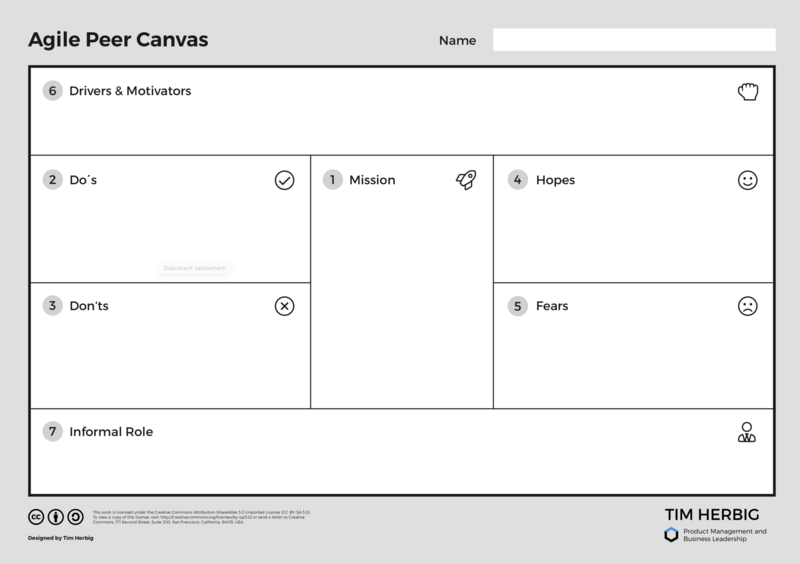 Ask them to prepare at least 2-3 items per section of the Agile Peer Canvas. To lead by example and lower the hurdles to get started, you can share your own Canvas in advance. When you meet for the workshop, everyone shares their self-perceived Canvas first with the rest of the team (agree on making this a safe space beforehand). To create a more holistic perspective, the team members have the time to suggest additional attributes for the Canvas of the presenter and can share it with her. The reason you want to keep this a two-sided conversation is that it’s not only about sharing your own thoughts but also gathering feedback from your peers on how they perceive you. Every team member presents their own canvas in this workshop. Peers have chance to give feedback for complementing inside-out perspective after each presentation. This step is the most important one in uncovering perspective gaps in terms of team roles. Keep the results visible at least within the team. Repeat with new team members/entire teams every 6 months or so. A more strategic use of these Agile Peer Canvas insights follows the scheme of Stakeholder Mapping. Using a matrix-like framework, you can visualize team members (or peers, depending on the environment you’re looking at) using this background for their objectives. For example, who has a more impersonal relationship to their work environment and will therefore also intervene and discuss conflicts on a more objective level? This could be in contrast to team members who bring more emotional buy-in to the table and are more likely to start a heated discussion that is related to their personal objectives. When I took over my first ‘grown-up’ development team as a Product Manager, it wasn’t clear to me that I was expected to lead them. Furthermore, I saw us as one happy cohesive collective of agile-minded people. While this is not necessarily a wrong perspective, I heard and noticed about some of the developers seeking guidance with their tech lead during our first sprints. Apparently, they looked more to him than to me for the direction we were headed. And to be totally honest: So was I. Especially product managers are often put in implicit leadership roles when they get asked to fill the ‘classic’ product owner role within agile teams. Lacking the comfortable safety of hierarchical power, they are tasked with leading a team of domain experts to meaningful outcomes. But experts like software developers or product designers usually only tend to accept leaders which surpass them in domain knowledge and skills. This is why they directly report to a dedicated team lead from within their domain in addition to being part of an agile team which is led by the product manager. When one tries to understand the craft and challenges of peers in agile teams, the most significant mistake is to step into their playing field. When you try to build-up practical knowledge about wireframing or deployment pipelines, the chances are high that you also start to intervene in the day-to-day business of your colleagues. The ‘perfect’ foundation for receiving more push-back instead of becoming part of the conversation while being respected as a leader. This training will help you master the challenges of being a lateral leader and thereby improves team collaboration on eye-level in Agile environments. It will guide you through strategic alignment with your organization, process alignment within your team, and proper alignment with other team members. In this webinar with the magazine Digitale Leute I introduced the concept of lateral leadership, as well as how to master it, how to create alignment und why you should see escalation as a tool to make progress instead of a weakness. In this talk I gave at MTP Engage 2018 in Hamburg, I share advice on how product people can lever lateral leadership for managing agile teams. Lateral leadership describes the art of efficiently influencing others around you without formal authority. It is essential for succeeding in the implicit leadership position product managers find themselves in. 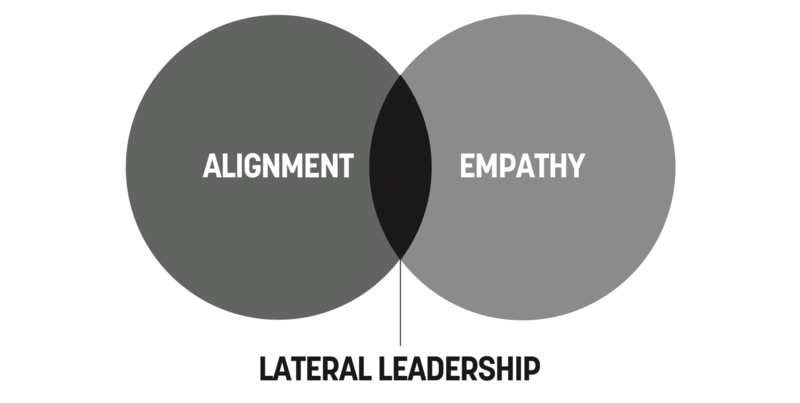 What is lateral leadership and how is it different from other leadership concepts? What is the first thing you would recommend for someone to do who wants to practice lateral leadership? 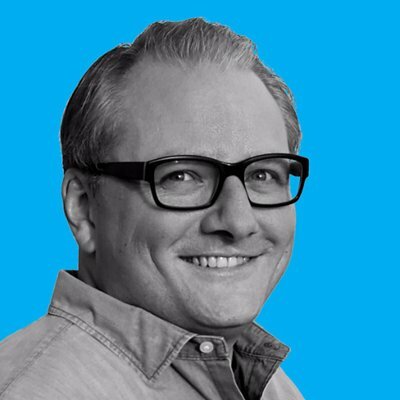 What’s the funniest thing that’s ever happened to you in the context of work? 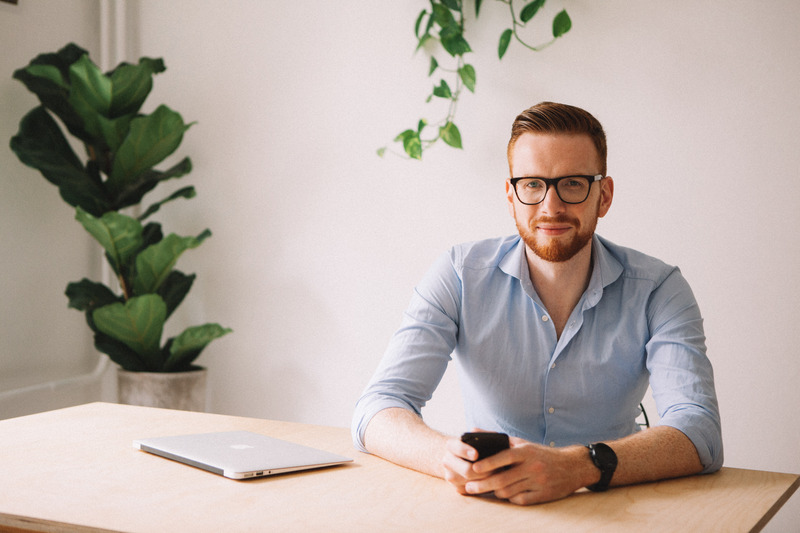 In this webinar with Jeff Gothelf of Sense & Respond Press I share my tips to maintain a leadership position in agile environments, where everybody operates on eye-level.